The second annual Gianmaria Buccellati Foundation Award for Excellence in Jewelry Design was presented on Feb. 8 to GIA (Gemological Institute of America) graduate Ching-Hui Weng. The competition – open to students who successfully completed the GIA Jewelry Design course in 2018 – recognizes artistic excellence in jewelry design. Weng was one of the 18 finalists from seven GIA schools around the world whose hand-rendered designs were judged by a committee of gem and jewelry experts in design, manufacturing and retail. Weng, who studied at GIA’s Taiwan campus, received her GIA Jewelry Design certificate in 2018. Her winning design was a yellow and white gold brooch featuring opals, aquamarine, lapis lazuli, black chalcedony, coral, and white and yellow diamonds. The Gianmaria Buccellati Foundation sponsored the award as a way to inspire beginning jewelry designers and honor the work of the renowned jewelry design house’s founder, Gianmaria Buccellati. Weng will travel to Italy where she will meet Mrs. Buccellati and view part of the foundation’s collection. She will also receive a plaque recognizing her achievement. The student’s designs were presented in original, hand-rendered formats accompanied by a material and an inspiration statement. Following several phases of judging, they were finally evaluated by a panel of industry experts. The recipient of the award was announced at the annual GIA alumni event held during the AGTA Gem Fair in Tucson, AZ. The 2019 Gianmaria Buccellati Foundation Award for Excellence in Jewelry Design competition is underway and open to students in GIA’s Jewelry Design courses who meet the eligibility requirements. 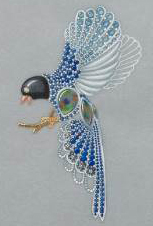 A brooch designed by Ching-Hui Weng, GIA Jewelry Design graduate, of a “Urocissa caerulea” bird that is native to Taiwan. The yellow and white gold brooch features opals, aquamarine, lapis lazuli, black chalcedony, coral and white and yellow diamonds. Photo by Emily Lane/GIA.